← Strange But Good~You Really Did That?? Happy February, Everyone! I’m happy to be getting back to all the fun of Saturday Snapshot. Hostessed by the lovely Melinda at West Metro Mommy Reads, Saturday Snapshot is always fun so be sure to check things out over there when you’re finished here! My snapshot today is a little old. I took this before New Year’s Day as the photo will show. I’ve mentioned before that Ralph likes to do artwork while we’re waiting for food at most of the restaurants where we go. This was at the local pizzeria just before New Year’s Day. Unfortunately, I thought he was finished when I took the photo. He embellished it more when he had finished eating. I forgot to take a photo of the completed masterpiece. It’s fun because the owner of the pizzeria loves Ralph’s stuff and has them hanging all over the bulletin board in the restaurant. It’s lots of fun. 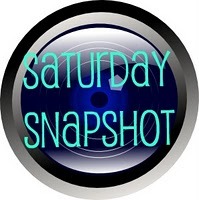 That’s Saturday Snapshot for today. Hope everyone will visit West Metro Mommy Reads to see what everyone else is sharing today. He’s very talented! You’ll have to show us a picture of the bulletin board with all Ralph’s artworks on it. Very talented indeed. What a great way to pass the time, while waiting on your order. I mostly doodle! Ralph is very talented. 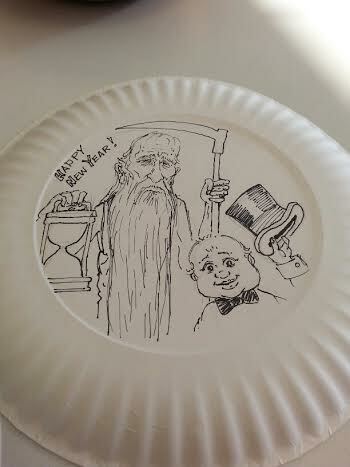 I take it that he doesn’t eat off the plates once he is done drawing on them. Nice! It’s neat that the pizzeria owner gets a kick out of them! I’ve said it before and I’ll say it again. Ralph’s got skills!! I should show you some of the REALLY good things.